It’s lovely, isn’t it? Blue from nature isn’t that common, so I really do like it when these dyepots turn out as I want them to. I’m sure it’s partly my old laptop screen causing the problem, but the entire photo has a blue gray green tint to it. i don’t see the blue or the green of the wool clearly. 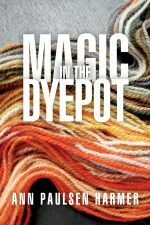 And, would love to see the died batch spun into yarn. I bet the variation in color depth will look cool. As for the color fading, I’ve heard that is typical with most natural dye plants. I had trouble adjusting the image so it would look on my screen as it looks in real life. 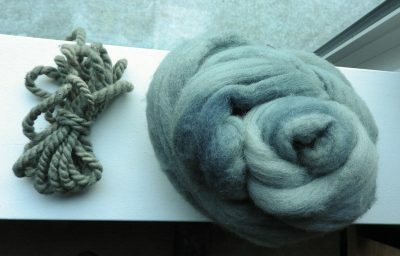 The wool is a deep sky blue – the best way I can describe it – with light indigo splotches where the colour intensified. The green is definitely a blue-green, not the gold-green that Phaeolus gives on iron-mordanted wool. I’ll post a pic of the spun yarn when it’s done.